With its annual revenue on the rise, a shipyard in Labuan is poised to regain its past glory as the biggest employer and key economic catalyst on the island after literally going "dead" for more than 15 years. Established in 1972, the shipyard, formerly owned by Sabah Shipyard Sdn Bhd (Saship) and now managed by Labuan Shipyard and Engineering Sdn Bhd (LSE), used to win contracts worth hundreds of million ringgit annually and had a workforce of more than 5,000 employees at its prime. This was until the late 1990s when its operations were severely affected by the global economic recession and subsequently went under receivership. When the LSE, a unit of Realmild (M) Sdn Bhd, took over the facilities, operations and all business activities of Saship in 2005, it was left with only 130 employees who were mainly involved in yard maintenance and servicing. After undergoing a massive transformation that involved refocusing and redefining its business strategies, the company has started to attract interest and make headway in its efforts to once again become the main economic driver on the island. "The first step we took was to correct the perception that the shipyard was already dead because of the long period of inactivity, from the late 1990s to 2005, through aggressive public relations exercise," LSE chief executive officer Mohd Azman Nasir told Business Times. He said the company refocused its core business by diversifying its services to cover oil and gas engineering and fabrication, rig repairs and refurbishment, ship repairs and marine craft repairs. With the positive changes taking place in LSE, the company has started to gain attention from industry players and securing credit facilities from financial institutions is no longer a problem. Its revenue last year was at RM35 million and Azman is confident that LSE's earnings will exceed RM100 million this year . 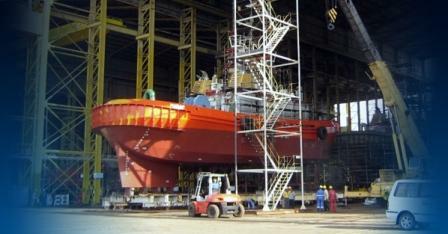 The shipyard has won numerous contracts to repair navy vessels and other craft. It recently clinched a project worth RM100 million for the engineering, construction, testing and delivery of a 77-metre Diesel-Electric Propulsion Platform Supply Vessel from Tanjung Kapal Services Sdn Bhd (TKS). The first of its type to be built in Malaysia, the vessel is designed, among others, for the transportation of deck cargo, personnel and equipment between offshore platform and shore base, external fire fighting, pollution prevention and rescue operations. Azman said winning the contract was crucial to enable LSE to prove its capability in handling a major project by delivering the vessel ahead of schedule and with the highest quality. Noting that TKS plans to order five to six more such vessels, LSE was committed and determined to complete the first order within the stipulated schedule, with the hope of clinching more contracts from the company. LSE has been working on two core competencies, involving the need to improve its yard services and getting the right people with the right experience to ensure quality and speedy delivery of projects. "We recognise the importance for us to identify our weaknesses and what we are lacking, in terms of competencies if we were to improve our services and operations," said Azman, who was appointed CEO of LSE in January last year. In March this year, LSE had secured a licence from Petronas for major fabrication works, signalling its intention and readiness to bid for big projects in the oil and gas industry. Azman said the company was already involved in doing fabrication works for the Kimanis Power Plant, Sabah Ammonia and Urea Plant in Sipitang and the Sabah Oil and Gas Terminal in Kimanis. "With the renewed interest we are getting from players in the oil and gas industry, I am confident that the LSE shipyard will regain its past glory within the next five years," he said, adding that by next year its workforce requirement would increase to more than 400.